We offer a variety of wood types including site finished, pre-finished, engineered, laminate, cherry, oak, ash and many others available direct from our distributor upon request. 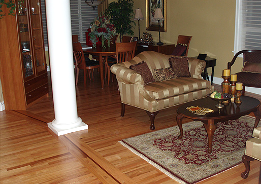 This wood is usually reddish-brown to rich dark brown in color with lots of character. It will darken over time and become richer in color. Cherry has a medium-density rating and is found more commonly in today’s homes. It should not be stained. Ash is creamy white in color with oak-like grains. It is slightly softer than oak and it holds up well. This type of wood is deep red and brown in tone. 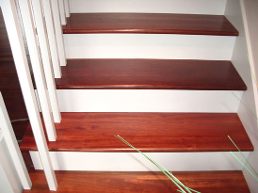 Unlike American Cherry, Brazilian Cherry is a very hard wood and holds up well in high traffic areas. It should not be stained. Fir has red tones and straight grain. It is commonly found in older homes or lodge-type settings. It has a very soft wood and is ideal for a more rustic look. Creamy white and brown throughout with hard and soft grain, Hickory is like Oak and wears well. It is also ideal for a more rustic/lodge feel. While it is best in a natural finish, it can be stained. Maple is usually creamy white in color. It is a very hard wood and is ideal for formal settings. However, it may show more surface wear over time with high traffic. This type of wood has a pinkish tone and is more commonly used in today’s homes. It is very forgiving and wears well in high traffic areas. It can be stained a variety of shades or left natural. White oak has golden tones and is commonly used in today’s homes. It is ideal for high-traffic areas. It can also be stained a variety of colors or left natural.